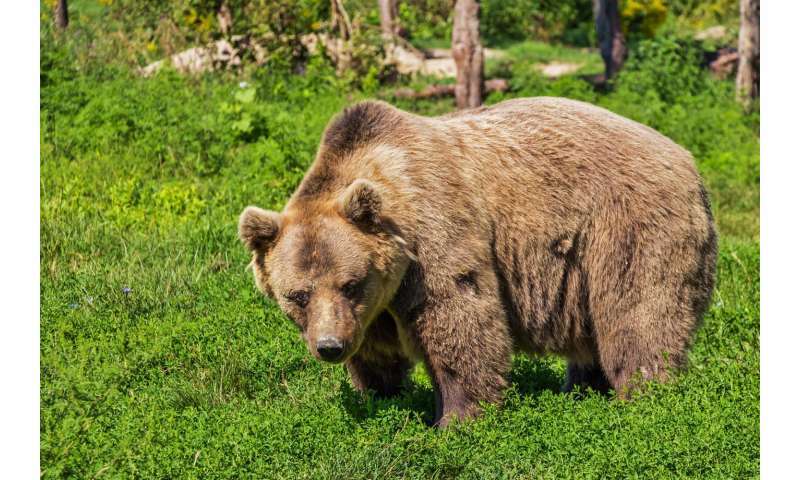 A team of researchers affiliated with multiple institutions in Russia and the U.S. has found that Siberian brown bears have a chemical in their saliva that has been found able to kill Staphylococcus aureus bacteria. In their paper published in Proceedings of the National Academy of Sciences, the group describes their study of the microbiome of a subspecies of brown bear and what they found. The Siberian brown bear lives in Mongolia, northern parts of China, and in Siberia. While mostly vegetarian, they will on occasion kill and eat caribou, elk and fish—giving them a varied diet that has a profound impact on their microbiome. The researchers were interested in studying the biome of the brown bear as part of a larger effort to study the biome of a large number of wild animals. The goal of the larger effort is to find naturally occurring chemicals that are able to kill bacteria that infect humans—bacteria that are evolving to become resistant to traditional treatments. To learn more about the microbiome of Siberian brown bears, the team captured several specimens in the taiga (a forested part of Siberia) and took saliva swabs which they carried back to their lab. There they used what they describe as state-of-the-art screening techniques to identify chemicals and organisms in the saliva samples. The team reports that they found evidence of Bacillus pumilus in the saliva, which produces an antibiotic chemical called amicoumacin A. The researchers suggest the bears get the microbes when they consume certain types of vegetation. After they found B. pumilus in the saliva, the researchers focused their study on it specifically and in so doing discovered the means by which it does battle with bacteria, specifically S. aureus—a type of bacteria associated with human skin infections. S. aureus is also one of the types of bacteria that are becoming resistant to traditional treatments, thus a naturally occurring chemical that can help humans fight it would be quite valuable. The team plans to continue studying the biome of the brown bear, along with other wild animals, in hopes of discovering the means by which they ward off bacteria that are giving us humans so many problems.